I recently posted some photos of hangyoku I found in the "Pictures!" thread. I remember seeing the A&E Documentary and they showed the part where Hana-Chan visited her old Okiya. And you can see the Apprentice Geisha, Hangyoku (spelling??) in the doorway. than the girls in the Pictures topic. I also saw a video of a Hangyoku dancing on a boat and she looked like the girl in the picture as well. The photo tags say "Asakusa" and "Tokyo" and she's using her real hair. Tokyo maiko aren't called maiko. 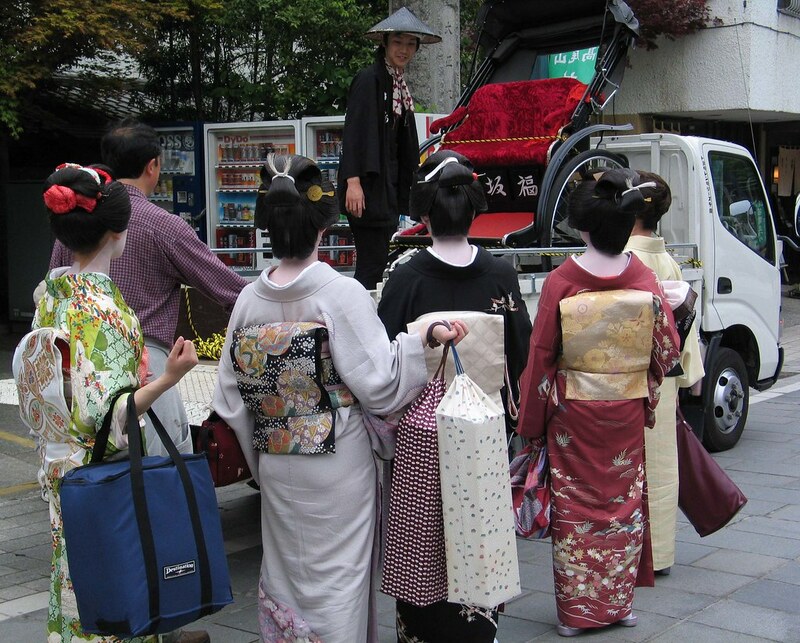 They are called hangyoku - "half jewels" based on the Tokyo euphenism for a geisha's wages. Hangyoku are not hangyoku for very long - something like six months to a year, unlike Kyoto maiko who are maiko for up to five years. Some hangyoku wear wigs, while others use their own hair. It depends on location on what they do. 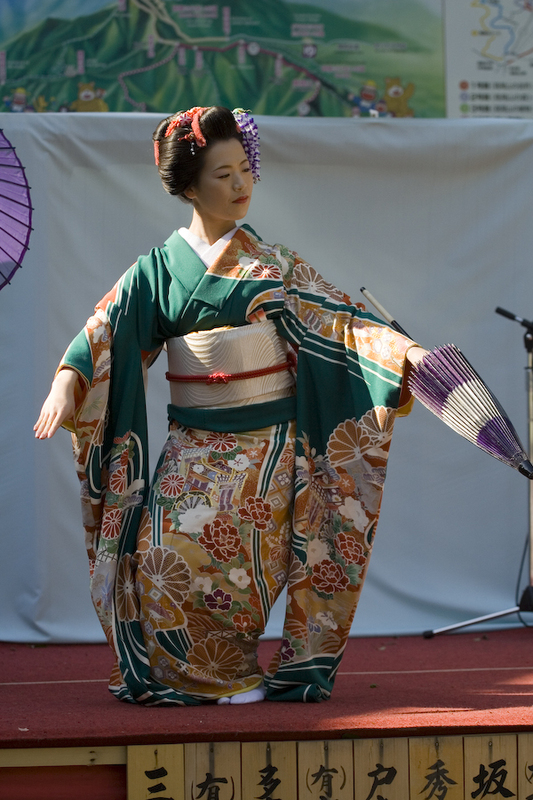 Tokyo geisha are also seen as being much more stylish and modern with their kitsuke and kimono. I believe both Dalby and Downer mention something about that. I'd have to go back and read about them, though, I can't remember much. I'm really interested in Tokyo geisha, now that I realize how little information there is about them. I remember reading in MOAG (no no, I know, not a good source) about how the Tokyo geisha were more modern, but other more reliable sources have said the same thing, so it's probably something that he actually got right. Their kimono are easier to walk in, their makeup a bit more practical, their obi musubi a bit more simple. 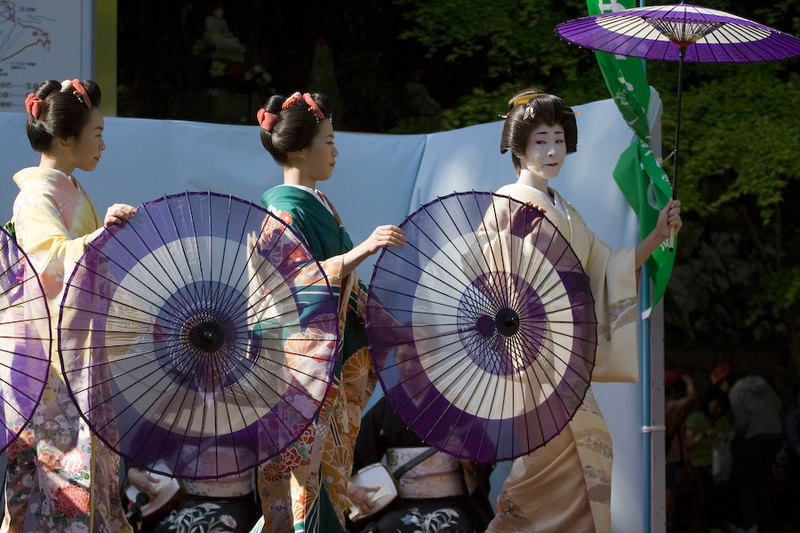 When you really think about it, it's astounding how different the geisha of Tokyo and Kyoto are from each other. If the way they dress is so different, it really makes you wonder how different the system works for them as opposed to the geisha in Kyoto, and how they work their traditions while still being a bit more modern. If I were studying for a career in anthropology, I would definitely make it a top priority to find out. I would enjoy studying anthropology when I reach college, but the problem is I can't speak Japanese! :eek: Otherwise, I'd totally go and do that. I would love to speak to Tokyo geisha. Interesting that the hangyoku has her neck done with the 'prong' shape. 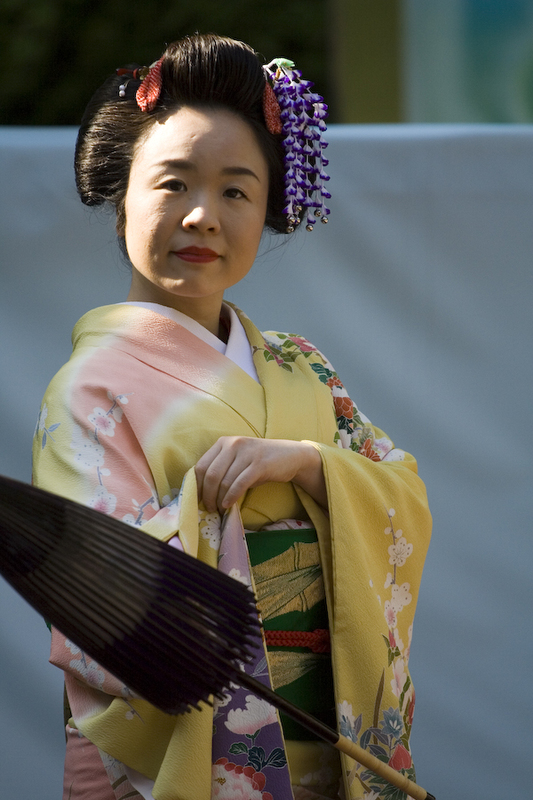 I have read in books like 'geisha; the life, the voices, the art' about a few Tokyo geisha. And Liza Dalby talks about them in 'Geisha', and even meets a few. But I do agree. 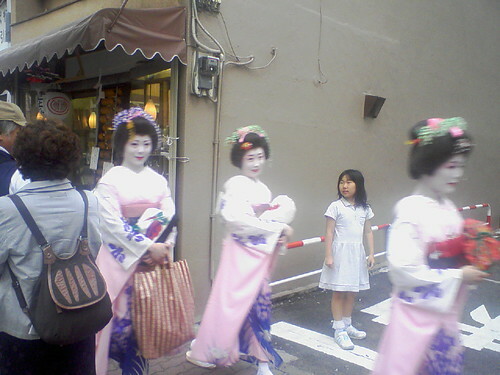 Yes, they are real geisha from the Mukoujima hanamachi of Tokyo. To this day, geisha from this district are apparently not considered top class or greatly accomplished in arts. 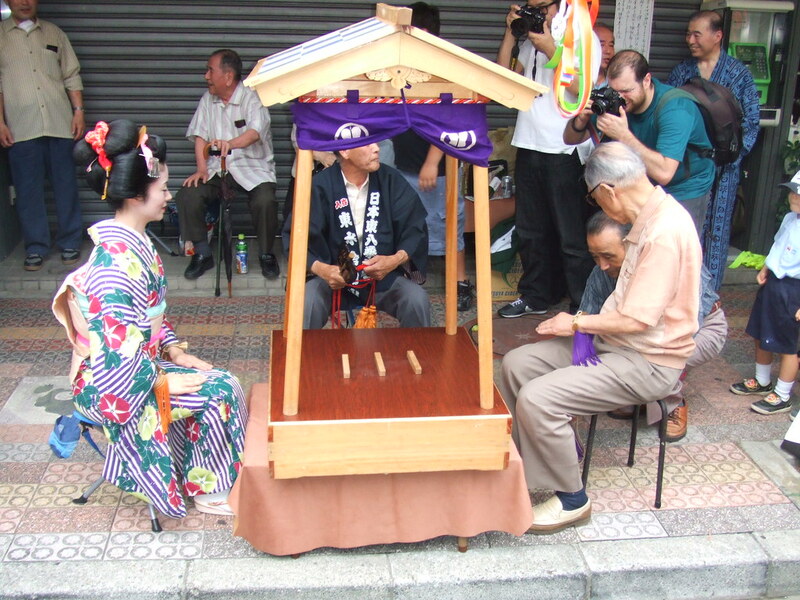 In the past, customers from Yoshiwara would cross the Sumida river to Mukoujima, where the geisha provided similar services. In the movie Sakuran, one of the other courtesans taunts Kiyoha by saying that her lover has gone to Mukoujima, implying that her services weren't good enough to keep him around.